Earnhardt hopes to celebrate again this weekend as he returns to Pocono for Sunday’s Axalta “We Paint Winners” 400 (1 p.m. ET on FOX Sports 1). The 12-time most popular driver can join NASCAR Hall of Famer Bobby Allison (1982–83) and Tim Richmond (1986-87) as the only competitors to notch three consecutive wins at Pocono. Seven wheelmen have swept Pocono in their careers and Earnhardt, along with Denny Hamlin and Jimmie Johnson can become the first drivers to do it twice. Earnhardt had never won at Pocono until last year, but has been successful at the Pennsylvania track since its repave in 2012 with finishes of eighth, 32nd, third and fifth prior to his two wins last season. The drivers Earnhardt should be most worried about ending his Pocono win streak: His Hendrick Motorsports teammates. Hendrick Motorsports has won the last five Pocono races with all four of its drivers: Earnhardt (2014 sweep), Kasey Kahne (2013 summer), Johnson (2013 spring) and Jeff Gordon (2012 summer). 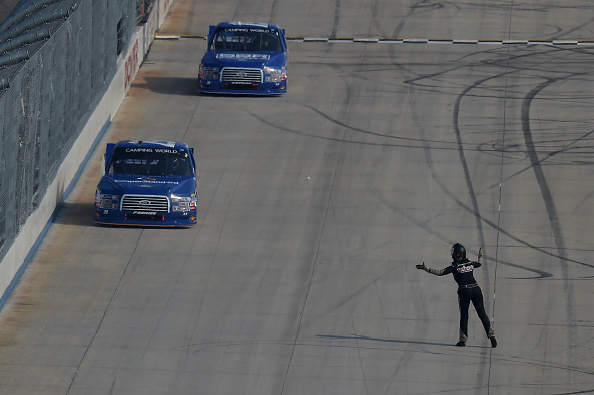 Johnson has all the momentum going into the race after taking the checkered flag last week in Dover for his NASCAR Sprint Cup Series-leading fourth win. Already virtually qualified for the Chase for the NASCAR Sprint Cup, the No. 48 Lowe’s Chevrolet driver can take a “win or wreck” approach because he can gain three bonus points for NASCAR’s playoffs with every victory he accumulates. Tyler Reddick delivered a clear message last weekend at Dover International Speedway. 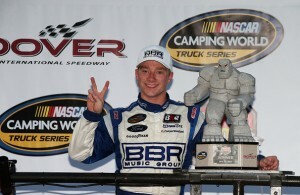 He let the rest of the NASCAR Camping World Truck Series know that he is a bona fide contender for the championship. Reddick cleared Erik Jones on Lap 193 of 200 and held off eventual second-place finisher Daniel Suarez for his second win of the season and the third overall for his Brad Keselowski Racing organization. Reddick gets the chance to visit Victory Lane at a 1.5-mile track in Friday’s WinStar Casino 400 at Texas Motor Speedway (9 p.m. ET on FOX Sports 1). He enters the race second in the NCWTS driver points standings, just 11 points behind Matt Crafton. The No. 19 Ford driver has made two starts at Texas. In his first race there last spring, he finished 21st following a wreck. Reddick showed vast improvement in his second Texas start, finishing fourth after capturing his second career 21 Means 21 Pole Award. Growing up racing sprint cars on dirt, Reddick is relatively new to piloting stock cars on asphalt. He’s been quick to adapt, finishing second in last season’s NCWTS Sunoco Rookie of the Year standings despite running just 16-of-22 races. This season – his first full-time campaign at any level of NASCAR – Reddick owns five top-five finishes in six races, tied for the series lead. What To Watch For: Dale Earnhardt Jr. will attempt to become just the third driver to win three consecutive races at Pocono after sweeping the track last season. None of the seven drivers to sweep Pocono have done it twice … After earning his 74th career victory at Dover, Jimmie Johnson is two checkered flags away from tying Dale Earnhardt for seventh on the all-time wins list … Hendrick Motorsports will attempt to continue its run of five straight wins at Pocono. Its 17 Pocono victories are almost double the total of the next-best organization (Joe Gibbs Racing’s nine) … Martin Truex Jr. is still hunting for his first win of the season even though he has led the most laps in each of the last three races … Denny Hamlin’s four Pocono wins tie him for third on the all-time list and his three Coors Light Pole Awards at the Tricky Triangle are the most among active drivers. 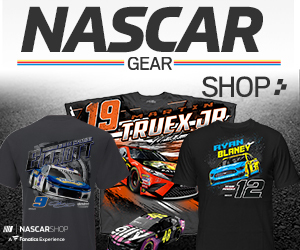 What to Watch For: Nineteen-year-old Tyler Reddick continues to gain on two-time defending series champion Matt Crafton in the standings after clinching his second win of the year at Dover last week … Erik Jones returns to Texas – the site of his first NASCAR XFINITY Series victory and the place where he received his high school diploma. Jones leads the NCWTS in numerous statistical categories, including: average running position (3.2), average start (3.2), number of fastest laps (239), laps led (328) and driver rating (125.6) … Defending spring Texas race-winner Matt Crafton will try to win in the Lone Star State again. He has not finished outside the top 10 at a 1.5-mile track in 11 starts, beginning at Kansas in 2014, and owns three wins – Texas-1 in 2014 in addition to Atlanta and Kansas in 2015.